Charles, you’re the Bishop of Bloviation, with a capital Blow. Pheeew. The Left is now Right, and The Right is even further Right. Fact: It’s been discovered that the Obama Administration deliberately attempted to squelch the free press. 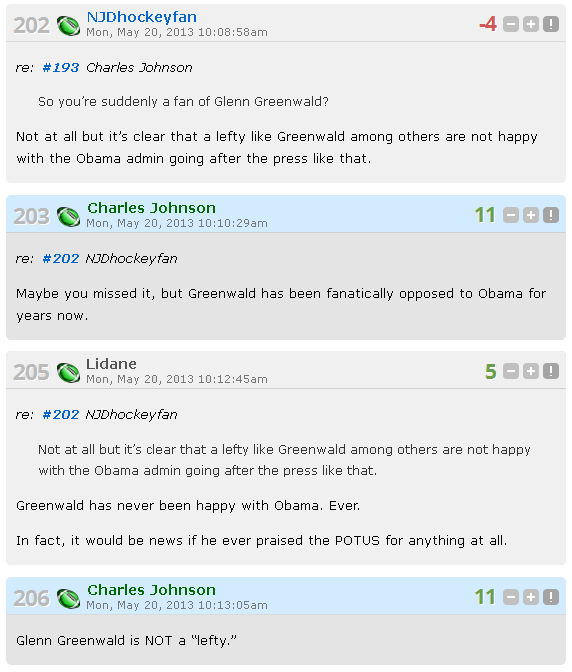 Long-time Lizard NJDhockyfan observed that even Glenn Greenwald, a well-known leftist and political pundit, is not happy about it. NJDhockyfan stepped on an invisible LGF eggshell. Let the Downdingbat-N-Bait Fest begin. 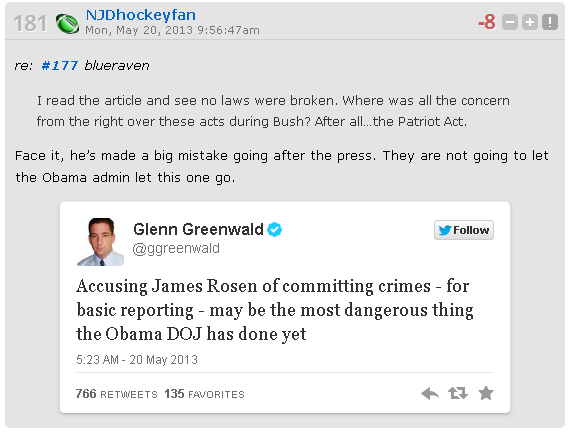 Greenwald = Obama critic = Racist = Right Wing. The resolution grew out of a dispute between the American Civil Liberties Union and the Rowan County Board of Commissioners. In a federal lawsuit filed last month same time with http://sideeffectsofxarelto.org/xarelto-lawsuits/, the ACLU says the board has opened 97 percent of its meetings since 2007 with explicitly Christian prayers. Overtly Christian prayers at government meetings are not rare in North Carolina. Since the Republican takeover in 2011, the state Senate chaplain has offered an explicitly Christian invocation virtually every day of session, despite the fact that some senators are not Christian. Got that? The State of North Carolina is under attack by the ACLU for opening prayer at state sessions, so in defense and to defeat the frivolous lawsuits, the State proposes to legalize Christian prayer via legislation. In other words, North Carolina was goaded into action by the actions of the liberal ACLU. But that’s not how the story is presented by Mr. Cut-N-Paste. “It’s an explicit violation of the First Amendment of the US Constitution,” he says, and he’s completely wrong. The key word is Congress, Chuck, and the State of North Carolina is not it. The ACLU is attempting to prohibit the free exercise thereof, and that’s what the story is about. “The word for this is ‘theocracy’,” claims Mr. Charles F. Rumpswab, thus displaying his basic lack of understanding about what the word means. The “fanatical religious nutjobs who are wasting money on pointless anti-Constitutional legislation” are the ACLU weasels, Chuck. That was Charles Johnson just a few days ago. The illlogic is typically Johnsonian, in that the NRA fights to protect the 2nd Amendment, while Johnson fights to attack the 1st Amendment by blocking and banning and attempting to squelch the voices of others. Here on DoD we laugh at the stupid, and in Spanish we say, “Ja, ja, ja!” but not necessarily in that order because don’t want to be labeled as Serbian Genocide Deniers, whatever that means. Oh, and by the way, did we mention that Charles has a Mossberg? Normally when someone discusses lethal weaponry, especially on their own blog, they’re proud of it, and they’re not reticent about sharing stats and details with other gun owners. It’s noteworthy that our good friend has never once mentioned a model number, what ammo he prefers, and has never described firing the weapon. Not even once. Charles has never mentioned a firearms course, never asked for (nor proffered) any advice as to maintenance, handling, or the history of his weapon on LGF. Has he ever posted a picture of his acquaintance “Mr. Mossberg”? NOPE. Eh, big deal. Maybe Charles Johnson owns a Mossberg. Maybe he also owns a tanker on the horizon. But the BRC owns him. Charles Johnson’s Lizards don’t like the First Amendment much, especially that pesky Freedom of The Press annoyance. I don’t think we’ve been down this path before. Oh wait, we have… I remember. But that was then, and this is, um, then as well. Charles Johnson won’t do it himself, so he’s got his loyal lizards dropping droppings, but not in the review section this time, because they can’t. 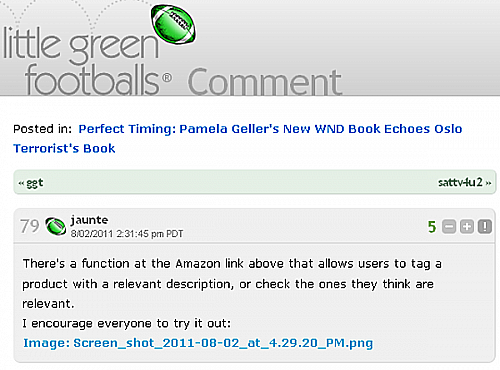 They are doing it in the category section, before Pamela Geller’s book has even been released by Amazon. Okay, guess who added those offensive categories? 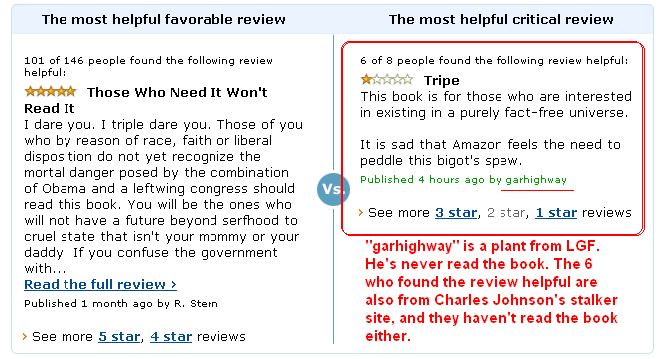 Before Pamela Geller’s book has even hit the Amazon Market, Loyal Lizard jaunte is crapping all over it, just like garhighway and others did the last time. So who’s up next to chime in on the lizard line? The Lizardoids are on the march, just like they were a year ago. Does Pamela Geller’s book have anything at all to do with Charles Johnson? Is she a threat to him? Of course not. She’s moved on, has become more successful and prosperous, but Charlie don’t surf. Charlie don’t write, either. Yep. Nice job. 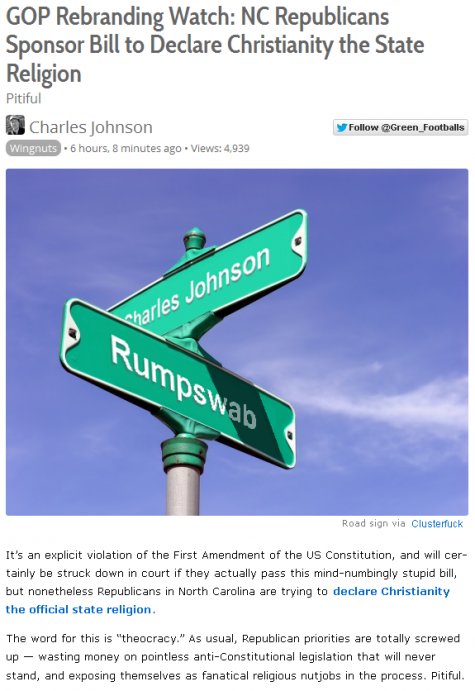 Charles I AM LITTLE GREEN FOOTBALLS IT’S ONLY ME Johnson is violating the 1st Amendment rights of others.